Marketing Excellence 3 showcases the strongest case studies - all winners - from The Marketing Society's Marketing Excellence Awards to celebrate and promote the contribution that great marketing makes to the commercial success of a business. The compilation includes a selection of 30 award winners from 2011 to 2014 who have employed different strategies, tactics, tools and techniques all worthy of recognition. The book features world-leading consumer products, retail, fast food, consultancy, charity and telecoms brands such as easyJet, Hailo, McDonald's, Mercedes-Benz, Unilever, Macmillan, O2, PwC, Jack Daniel's and John Lewis. 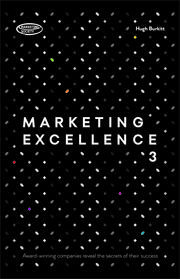 Each chapter of Marketing Excellence 3 is organised by theme and introduced by a judge who then presents the case studies in detail, providing thought-provoking answers to questions such as 'How do you find great customer insights? ', 'What are the key principles that lie behind effective communications? ', 'How do you create a marketing ethos that will mobilise your organisation? ', 'What makes a new brand stand out and succeed?' and 'How do you keep customers loyal?' As such, it is an ideal book for marketers and students looking to be inspired by the very best in marketing campaigns.